Description Art site is on vertical rock wall with a shallow overhang. It is on the northern side of the Moran River. The site is approximately 100m upstream of Site 1. The Moran River in this locality is enclosed in a deep gorge. 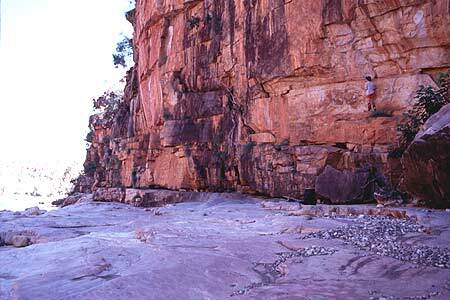 Some rock scrambling is required to reach the art site, however, it is visible from the ground. This panel is on a vertical rock wall. The art is reasonably preserved. 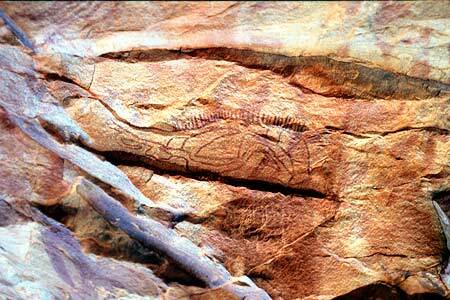 The crescent shaped painting furthest to the left is approximately 40cm long. Interpretation The art in this panel is a brick-red colour. 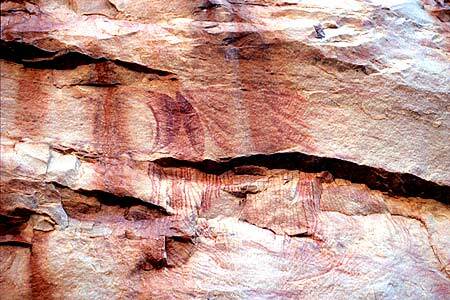 The crescent and shield shaped paintings may represent yams or baskets? The crescent and the shield furthest to the left are oriented vertical and are the darkest coloured of the shapes. The artist has shaded one side of the shapes, which gives an indication of their rounded 3D shape. The shield shapes to the right are relatively faded and are oriented at an angle, sloping down to the right. These crescent and shield shapes appear to have been created as a single work. Underneath the crescent and shield shapes is a large area of line work. Many closely spaced parallel lines have been painted going down the wall, which then converge to meet at a point. At first glance, the painting looked like it was lots of paint dripping down the wall.